View of “DDR Noir,” 2018. For Henrike Naumann’s exhibition “DDR Noir,” an assembly of various interiors inhabits the street-level gallery in the monumental socialist classicist architecture of East Berlin’s Frankfurter Tor. 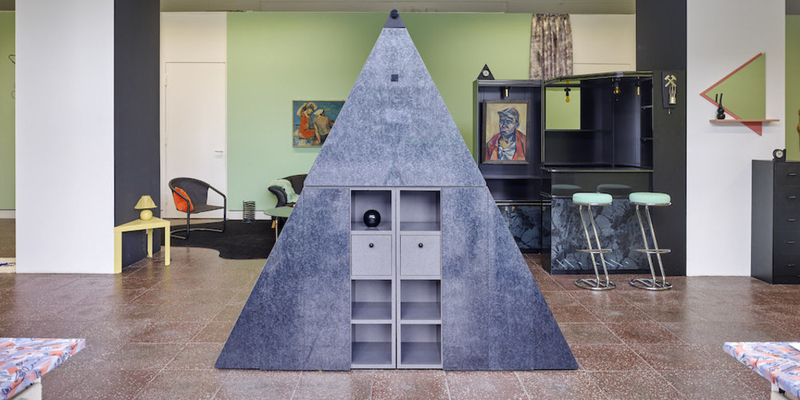 Here, Naumann, who was trained as a set designer, has arranged a series of living rooms composed of triangular cabinets and wavy sideboards—knockoff Memphis pieces that entered East German markets after reunification in the 1990s. The setting is layered with culturally specific signifiers, from a printed Donald Duck rug to wire figurines of Mickey Mouse and Sandmännchen (Sandman), a character from an East German children’s bedtime television program that remained on air after reunification. Within glass cabinets and behind curtains are paintings by Naumann’s grandfather, Karl Heinz Jacob (1929–1997). In Paar mit schwangerer Frau (Couple with a Pregnant Woman), 1959, a couple clasps hands next to a woman’s pregnant belly, and a child sits placidly in Nele Jakob mit Katzenbilderbuch (Nele Jakob with a Cat Picture Book), 1962. Galerie im Turm was founded in 1965 as an exhibition space for the German Democratic Republic’s Guild of Artists, and given Jacob’s membership in the guild as well as his deployment of socialist realist language to portray homely scenes of quotidian life, his paintings would have felt at home in this space some forty years prior. Riffing on the touchingly ugly forms that once filled the country’s homes, Naumann offers up art of the former eastern republic for contemporary evaluation without nostalgia for, nor outright condemnation of, the former socialist regime. With its mishmash of past and present, east and west, the exhibition becomes a reflection of the kinds of realism that Naumann finds possible in contemporary German life, while showing that what is defined as normal depends on the contextual standards of (dis)comfort.